You can tell a lot about your plant’s health from its leaves. When they’re green, shiny and flexible, all systems are go; that plant is happy and care-free. But when plants develop brown leaves in the middle of their canopy or leaf browning in center of leaves, problems are afoot. Most of the time, these symptoms can be traced back to improper growing conditions, but they may also be caused by fungi and viruses. The center rotting out of a plant is almost always related to crown or root rot. Most plants can’t tolerate a soggy environment, especially those with crowns densely covered with leaves, like African violets. When you keep the soil wet all the time, fungal pathogens take advantage of the humidity that develops under the leaves of these low-growing plants, reproducing rapidly. Both root and crown rot can appear similar in these short plants, with the plants going brown in the center as the disease progresses. If you’re asking yourself, “What is causing brown leaves in center of my plant,” you need to check the soil moisture first. Allow the top inch or two of soil to dry between waterings and never leave plants soaking in water-filled saucers. Plants with root rot may be saved if you catch it in an early stage. Dig your plant, trim out any brown, black or soggy roots and replant into a well-draining medium — chemicals won’t help, the only thing that will fix root rot is a drier environment. Other reasons why leaves turn brown in middle include fungal diseases like anthracnose and host-specific rusts. They often start along the mid-vein of leaves, either near the center or toward the stem end. 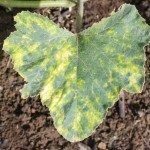 Fungal diseases are aggravated or initiated by humid conditions. Rusts can be treated early in the disease process, but good sanitation is vital to prevent it from spreading further. When tiny, rust-colored spots appear in the middle of your plant’s leaves, try neem oil before breaking out stronger chemicals like thiophanate methyl, myclobutanil or chlorothalonil. Remove any plants that resist treatment and keep all plant debris cleaned up off of the ground. 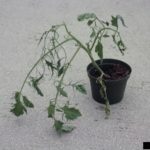 Anthracnose also begins along the mid-vein in many plants, but is primarily a problem for woody plants, although tomatoes and other crops have been known to contract it. This fungus creates water-soaked lesions on leaves along the mid-vein that soon dry out and brown. Anthracnose is difficult to treat, but crop rotation and sanitation are the keys to preventing reinfection. A number of plant viruses result in vein necrosis, the death of the central leaf vein and those tissues surrounding it, causing browning. Other common symptoms include discolored spots, rings or bullseyes in a range of colors, general unthriftiness and distortion of emerging growth. A plant affected by a virus cannot be cured, so it’s best to destroy them before other plants are infected as well. Many viruses are vectored by small, sap-sucking insects; be on the lookout for pests in and around sick plants. Read more articles about Plant Diseases.